Some readers likely noticed my new photograph which highlights the desk sign reading: “The Buck Stops Here.” At the January Board of Directors’ meeting in Florida, Past Chair Michael Daggett and his wife Sharon presented that sign to me. Michael explained that he had seen the sign in the Truman Library and, with my being from Missouri and becoming NASBA’s new President and CEO, that it was an appropriate gift. It is now proudly displayed on my desk. Being the new President of NASBA in no way compares to the tremendous pressures that President Truman faced in replacing a hugely popular predecessor in the middle of a world war, but transition and implementing change at NASBA offer opportunities and challenges that bring Mr. Truman’s motto into the forefront. As I have traveled around the country, or visited by telephone, many of you have made positive comments about our concentration on State Boards through the “Back to Our Roots” initiative. But I have also heard some criticism and suggestions as to how NASBA could do a better job. I cannot overemphasize my appreciation for the candid comments that many of you have shared with me. It is my hope and belief that the transparent sharing of information and recommendations, even if critical, is indicative of a healthy and trusting relationship, the kind of relationship I want to have with every State Board of Accountancy. 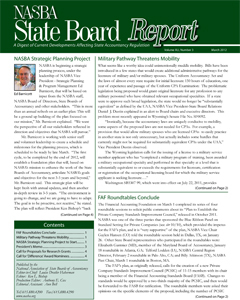 President's Memo: The "NASBA Position"